Where resale tickets are available, they are sold by fans at the price they paid (face value + fees), or less. 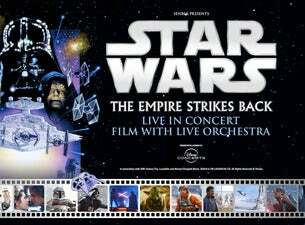 Following on from the success of 2018’s arena tour of Star Wars: A New Hope Live with Orchestra, the second film released in the franchise, Star Wars: The Empire Strikes Back, will be performed live in UK arenas in autumn 2019, featuring Oscar-winning composer John Williams’ musical score performed live to the film. The battle for the galaxy intensifies in this thrilling fifth episode of the unfolding saga. As Imperial Forces launch an all-out attack on the Rebel Alliance, Han Solo (Harrison Ford) and Princess Leia (Carrie Fisher) flee to Cloud City where they are captured by Darth Vader. Luke Skywalker (Mark Hamill) journeys to the mysterious, marshy planet of Dagobah, where the wise Jedi Master Yoda teaches the young hero the ways of the Force. Little does Luke know that all his Jedi training will be called upon so soon. A stunning revelation – and a life-or-death battle with Darth Vader – awaits. Legendary composer Williams is well known for scoring all eight of the Star Wars saga films, beginning with 1977’s Star Wars: A New Hope for which he earned an Academy Award for Best Original Score. His scores for Star Wars: The Empire Strikes Back, Star Wars: Return of the Jedi, and Star Wars: The Force Awakens were also nominated for Best Original Score.